'World of Dance' Qualifiers The Rock Company. Photo by Justin Lubin/NBC. The Qualifiers Round continued as more hopeful dancers hit the World of Dance stage to prove that they deserved to compete against the best of the best and win the ultimate prize. The night was a mixture of competitors from the last season, as well as some fresh faces to keep the bar set high. ‘World of Dance’ Qualifiers DNA. Photo by Trae Patton/NBC. 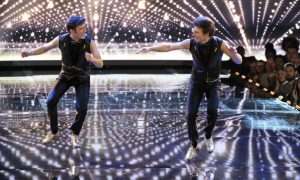 One of the returning competitors was DNA, a ballroom duo that was eliminated after the Duel round last season. The power couple came back with a vengeance in hopes of redeeming themselves, and they did just that. Their ballroom routine packed a punch with both grace and intensity, not only with the movement but with their musical choice as well. With each explosive transition, DNA continued to build with their energy, and their chemistry was the icing on the cake to make it a memorable performance. They returned stronger than ever with stunning technique to match. According to judge J-Lo, the duo was even more amazing this year compared to last year. With a score of 87.7, DNA is on a mission to prove why they deserve to go even further in the Duel round. ‘World of Dance’ Qualifiers Brotherhood. Photo by Trae Patton/NBC. Next to take to the World of Dance stage was the hip hop crew, Brotherhood, from Vancouver, Canada. Brotherhood came equipped to constantly entertain as they performed a hockey-themed hip hop routine. They served great visuals, including using one of their members as a hockey puck, which was a great touch based on the reaction from the judges and audience alike. While bringing the audience into a hockey game but with hip hop, Brotherhood’s precision was out of this world with intricate transitions to top off their routine. Although their performance was well-received, Brotherhood was challenged to “up” their game in order to match their competitors in the Duels. Although they just barely made it through the Qualifiers after scoring 80.3, Brotherhood will get to prove why they belong in the competition. ‘World of Dance’ Qualifier Vivian Ruiz. Photo by Justin Lubin/NBC. Contemporary dancer Vivian Ruiz graced the World of Dance stage with a routine that was very close to her heart. After experiencing her first heartbreak, this 16-year-old translated her story through a heartfelt contemporary performance. Vivian’s emotion alone was enough to draw the judges in, and her technique and poise was the perfect touch needed to solidify her story. She showed great musicality throughout her routine and danced way beyond her years. Vivian expressed a story of moving on throughout her performance that was complemented even more by the music. Continuing in her path to move on, Vivian will be moving on to the Duels to compete against other amazing contenders. ‘World of Dance’ Qualifiers The Untouchables. Photo by Trae Patton/NBC. The Untouchables were next to perform in the ballroom genre. Leader of the group, Manny, who competed last season as a ballroom duo with Amanda, returned with his father’s newly formed group with a lot to prove. These young firecrackers sent sparks through the World of Dance stage with a routine that seemed to never stop. Their energy was through the roof as they performed a mixture of Samba and Capoeira, taking Latin dance to the next level. There was an undeniable Brazilian vibe, along with great athleticism from the talented boys and girls within the group. The Untouchables gave a show-stopping performance that was well-received, especially by the judges. Eager to see what more they have to offer and scoring 88.7, The Untouchables are on their way to the Duels. ‘World of Dance’ Qualifiers Ashley and Zack. Photo by Trae Patton/NBC. Ashley and Zack came next with a contemporary duet. With great chemistry from the very beginning, Ashley and Zack’s performing was effortless from one transition to the next. Their technique was exceptional and was further complemented throughout each movement. The partnering stunts alone were breathtaking as expressed in the reaction from the audience, as well as the judges. Although they were not a couple, the story this contemporary duo told was a believable story throughout their performance. With a score of 85.0, Ashley and Zack can continue to move the audience and judges in the Duel round. Closing out the sixth round of the Qualifiers was The Rock Company. Competing a contemporary routine, The Rock Company paid tribute to those who lost their lives in the tragic shooting in Vegas on October 1. Bathed in a sea of white costumes, they began their performance with a cannon of movements, all while connected to each other. The visuals they presented were quite picturesque and set the mood for their performance right away. The genuine emotion from each dancer reeled everyone in and even brought the judges to tears. The Rock Company delivered great synchronicity throughout their performance and matched that with true artistry and technique beyond their years. They set waves through the Junior team division scoring a 96.7.
Who will be next to create waves on the World of Dance stage? Tune in! You won’t want to miss it.